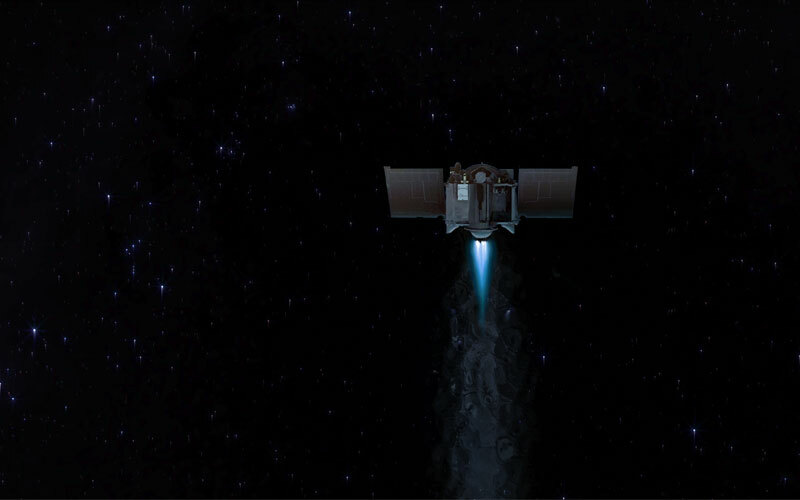 NASA officials have confirmed that their OSIRIS-REx spacecraft has completed the first of four Asteroid Approach Manoeuvres (AAM) on its way to the near-Earth asteroid, Bennu. With the successful completion of AAM-1, the spacecraft is on schedule to arrive at the asteroid later this year. The four Asteroid Approach Manoeuvres are designed to slow the spacecraft’s approach and to navigate it through a precise corridor of space. AAM-1 was completed on October 1 with the spacecraft decelerating from approximately 491 m/sec (1,100 mph) to 140 m/sec (313 mph). OSIRIS-REx mission officials are currently examining telemetry and tracking data with the results of the manoeuvre set to be released next week. The final AAM is scheduled for November 12 and will alter the spacecraft’s trajectory for arrival 12 miles (20km) from Bennu on December 3. Following its arrival, OSIRIS-REx will perform a number of asteroid proximity operations including several fly-bys of the asteroid’s poles and equator. OSIRIS-REx is NASA’s first asteroid return mission. It will attempt to rendezvous with the near-Earth asteroid Bennu, collect samples, and return to Earth. The OSIRIS-REx spacecraft was launched aboard an Atlas V rocket from Cape Canaveral on September 8, 2016, and is expected to rendezvous with the Bennu on December 3. Following a number of scientific operations including collecting samples, the spacecraft will return to Earth splashing down in March 2021 completing the 5-year mission. Bennu was selected as a target for research for a number of reasons including its distance from Earth and its size. Additionally, the asteroid is believed to be a leftover fragment of the energetic formation of the solar system. As a result, scientists are hopeful that the asteroid could help us understand the origin and nature of the universe.